Fidelity Go’s competitive fees and $0 account minimum are appealing, but investors with taxable accounts won’t get tax-loss harvesting. The Bottom Line: Fidelity Go is a strong, low-cost choice for investors who don’t need access to a human advisor. Fidelity Go, the robo-advisor from online broker Fidelity Investments, brings a different pricing model to the market, charging an all-in fee with no added investment expenses. Both taxable and IRA accounts pay an annual advisory fee of 0.35% of the account value. Fidelity Go uses index funds, primarily its own, to build portfolios that a human investment management team monitors and rebalances. Investors are not charged expense ratios by those funds. Fidelity Go also has no account minimum, though a balance of $10 is necessary to begin investing. Low cost: Fidelity Go charges a 0.35% management fee, with no additional investment expenses. Portfolios primarily use Fidelity Flex funds. There is one bit of fine print: Some customers could incur additional expenses associated with the Fidelity Government Cash Reserves Fund, if included in their portfolio. Fidelity says such expenses can be offset by a variable fee credit. Fidelity integration: Fidelity Go customers are integrated in the company's existing retail managed business. Customers who already have an IRA or taxable account with Fidelity can easily take advantage of the company's robo offering. Fidelity Go is not available for 401(k)s held at the company, though you can roll over your old 401(k) into a Fidelity Go account. Online advisory clients also get access to Fidelity’s financial planning tools and apps, as well as the company’s customer support and educational resources, both of which are strong. And investors can fund their accounts with the 2% cash-back rewards earned from the Fidelity Rewards Visa Signature card. Human management: It’s common among broker-launched online advisors to pair computer algorithms with dedicated financial advisors. Fidelity Go takes a different approach: The day‐to‐day investment and trading decisions for portfolios are handled by a team of humans from Strategic Advisors, a registered investment advisor and Fidelity company. The advisors also rebalance portfolios when a customer’s portfolio moves outside of the asset allocation or risk tolerance preferences they specified. That oversight makes Fidelity Go a good choice for those who are reluctant to hand off all of the control to a robot — though it’s worth noting that those advisors aren’t there to answer your phone calls. Fidelity Go has live chat and phone support staffed by customer service representatives. Like other advisors, Fidelity Go uses a questionnaire — designed to gauge risk tolerance, goals and financial — and computer algorithms to match investors to a portfolio. We especially like that without signing up or sharing any personal information, users can take that questionnaire and view a portfolio recommendation and sample investments. Account minimum: Fidelity requires no minimum deposit to open an account, though you must have at least $10 in your account to begin investing. 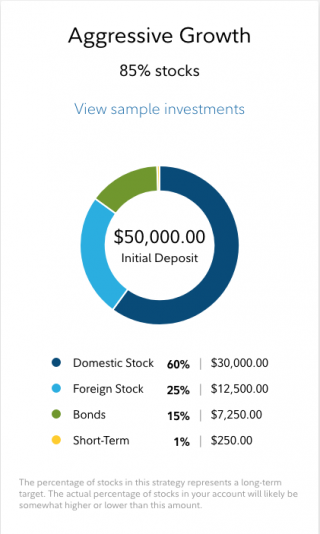 That's in line with some independent robo-advisors like Betterment, but it's incredibly competitive compared to the minimums required by some other big players: Vanguard Personal Advisor Services requires $50,000 and Schwab Intelligent Portfolios has a $5,000 minimum. Tax strategy: The company does not offer tax-loss harvesting, one of the features that makes robo-advisors stand out for taxable accounts. Fidelity does use tax-advantaged municipal bond funds in taxable accounts, which can help minimize your taxes. Cash funding only: The company doesn't allow transfers of securities in kind, even by existing Fidelity customers who already hold the funds used in Fidelity Go’s portfolios. You must sell all securities before enrolling in the service. Is Fidelity Go right for you? If you’ve been wanting to test the robo-advisor waters but you feel more comfortable with an established broker, Fidelity Go has a lot to offer. The fees are competitive, and the portfolios are well-diversified and closely monitored by real live humans. There’s also a low account minimum to help you get in the door, especially compared with other broker-owned online advisors. Investors with taxable accounts, however, will miss the tax-loss harvesting offered by other robo-advisors. Also, we wish Fidelity Go would make it easier to transfer securities — or at least facilitate the sale of them before transfer, as E-Trade Core Portfolios does — from existing Fidelity accounts.